So shock horror, I love MasterChef - I know, I keep on surprising - but my love deepened when my favourite chef, Jamie Oliver was a guest chef. I mean who doesn't love Jamie Oliver? He speaks as fast as he chops, and the end result is sophisticated but relatively easy to recreate! And that's what I like to do! So after watching MasterChef - I set myself the challenge. 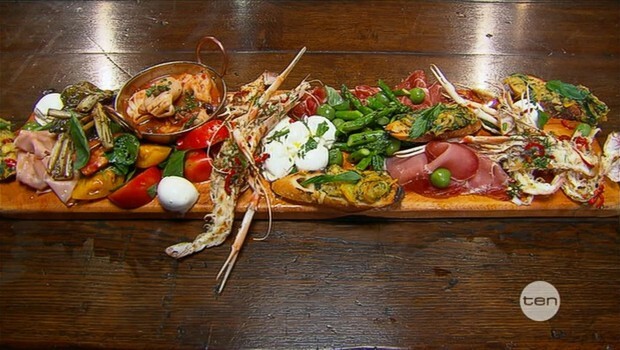 Hint: The challenge was this: the three girls up for immunity had 45 minutes to create there own "Antipasto Plank" - Jamie Oliver's life changed for the better when he came up with his own plank - the pro (Jamie) had 30 minutes. Let the FUN begin! No surprise, Jamie's antipasto won-over the judges hearts. Ever since - I can't stop thinking about it. So I set myself the challenge, the Shooz Antipasto Plank. And yes, I did it in under 45 minutes, and was a great dinner. A little much for just me, but there was plenty of leftovers for hubby and I for lunch, conciliation prize! Tomatoes (still on the vine), placed on a lined baking tray, seasoned with salt and pepper. place in the oven for 30 minutes. 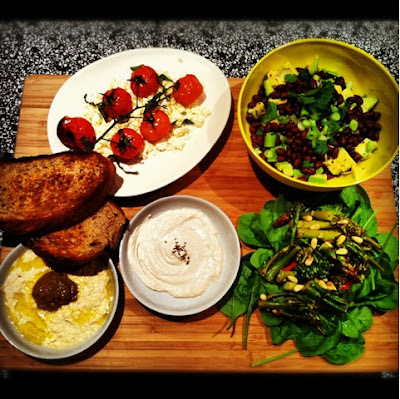 Allow to cool down and place on a bed of crumbled feta. Drain and rinse a can of black beans, and place into a bowl. Cut one avocado and throw into the bowl. Top with chopped shallots, lemon juice, salt and pepper. Finish with a sprinkle of coriander. In a medium size pot, cook a teaspoon of garlic, add chopped asparagus & broccolini (chilli optional), squeeze in half a lemon and cook for 5 minutes with a lid on. Serve on a bed of baby spinach leaves and finish with toasted pine nuts on top. I think this will be the first of many planks! Be sure to comment if you tried it yourself or need a hand.